In order to provision the Intel AMT enabled devices for Enterprise Mode, the AMT technology mandates that the Provisioning Server must have a server certificate with a unique Intel AMT OID and an OU that traces to a certificate authority (CA) whose root certificate hash is stored in the Intel AMT enabled device. To generate the Intel AMT Management Certificate for a ZENworks Server that uses an internal certificate authority, run the zman (iamt-create-mgmtcert | icmc) command at the command prompt. isCA= true for Intel AMT Management if it can mint certificates for Intel AMT devices. isCA= false for Intel AMT Management if it cannot mint certificates for Intel AMT devices. Use the generated CSR to get the Intel AMT Management Certificate signed by the external CA. To obtain the ZENworks CA hash, run the zman [iamt-root-certificate-hash | irch] command at ZENworks Server command prompt. Continue with Configuring the Intel AMT Device with the ZENworks CA Hash. Power on the device. When you are prompted, press the Ctrl and P keys to display the Intel Management Engine BIOS Extension menu (MEBx). Dell devices: See Intel Management Engine BIOS Extension (MEBx). HP devices: See AMT Setup and Configuration for the Z200 Workstation with Intel AMT Technology . Other devices: Refer to the product documentation available at the vendor site. In the Intel ME Password field, specify the Intel AMT password. (Optional) To change the password, select the Change Intel ME Password field and specify the new password in the Intel ME New Password field. Select Host Name and specify the name for the Intel AMT device. The host name of the AMT device should resolve through DNS. Select TCP/IP, enable DHCP, then specify the domain name. Select Provision Mode field and press Enter. Ensure that Enterprise Mode is selected and press Enter. Select Setup and Configuration to display the Intel Setup and Configuration Page. Select Provisioning Server and specify the IP address and port number (9971) of the Provisioning ZENworks Server. Select TLS PKI to display the Intel Remote Configuration page. Ensure that Remote Configuration is enabled. Select Manage Certificate Hashes and press the Insert key to add a new hash. Specify the hash name. Specify the hash certificate that you obtained in Section 3.2.1, Configuring the ZENworks Primary Server for Intel AMT Management. You must specify the characters in the same sequence as the generated hash, but in groups of four alphanumeric characters separated by a hyphen.For example, if the generated certificated is 1F:0E:1C:88:A0:88:B5:6A:E8:82:6D:28:01:D4:2F:B4:6F:8D:16:77, then you must specify the hash certificate as 1F0E-1C88-A088-B56A-E882-6D28-01D4-2FB4-6F8D-1677. Select Provisioning Server FQDN and specify the fully qualified domain name of the Provisioning ZENworks Server. Select Set PKI DNS Suffix and specify the DNS suffix. Select Return to Previous Menu to return to the Intel Setup and Configuration page. Select Return to Previous Menu to return to the Intel AMT Configuration page. Select Return to Previous Menu to return to the Main Menu. In the Main Menu, select Exit. When prompted, press Y to save the Intel AMT Configuration. Continue with Section 3.2.3, Adding the Intel ME Credential of the AMT Device to the Credential Vault. Locate the USBFile.exe utility in the following location: \Windows\Intel_Manageability_Configuration\Configuration\ConfigurationServer\Bin\ConfigScripts. If the USBFile.exe is not available, download the file from the latest Intel AMT Software Development Kit . Run the Intel Utility (USBFile.exe) to generate a USB file named setup.bin. Copy the generated setup.bin file to a USB device. Boot the Intel AMT enabled device with the USB device. 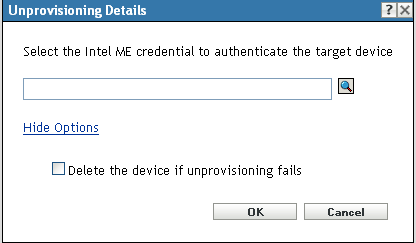 Continue with Adding the Intel ME Credential of the AMT Device to the Credential Vault. You can check the online Help for more information on how to add a credential to the Credential Vault. Specify the login name as admin. Specify the password that you set on the device in Step 2. Continue with Provisioning the AMT Devices. You must provision a device to establish a mutual trust between the device and the Management Console. In the ZENworks Control Center, click Devices. Click the Intel AMT Devices link to view all the discovered Intel AMT devices. The validity of the discovered Intel AMT devices is twelve hours, after which you need to rediscover the device. Select the Intel AMT devices that you want to provision, then click Action > Provision. In the Provisioning Details dialog box, browse for and select the appropriate Intel ME credential of the target device. Deploy the ZENworks Agent to the devices so that you can manage them. For more information on how to deploy the ZENworks Agent, see ZENworks Agent Deployment in the ZENworks Discovery, Deployment, and Retirement Reference. Continue with Section 3.2.5, Reconciling the AMT Devices. The validity of the discovered Intel AMT devices is one day, after which you need to rediscover the device. Select the Intel AMT device that you want to provision, then click Action > Provision. Browse for and select the appropriate Intel ME credential of the target device. Select the Use External Certificate to Provision the device check box. Browse for and select the private key file for the targeted Intel AMT device, then click OK.
Browse for and select the certificate file for the targeted Intel AMT device, then click OK.
Continue with Reconciling the AMT Devices. In the Management Zone Settings panel, click Inventory > Out-of-band Inventory Reconciliation to display the Out-of-band Inventory Reconciliation page. (Conditional) To immediately start the reconciliation process, click Start Now. For more information on the various schedule types, click Help on the page. You can unprovision a provisioned Intel AMT device. In ZENworks Control Center, click Devices. Click the Intel AMT Devices link to view all the discovered/provisioned Intel AMT devices. Select the Intel AMT devices that you want to unprovision, then click Action > Unprovision. Select the Delete the device if unprovisioning fails check box, if unprovisioning fails and you want to delete the Intel AMT device. Before you change the zone certificate of the Primary Server, unprovision all the provisioned Intel AMT devices. To change the zone certificate, see Changing the Certificate Authority in the ZENworks SSL Management Reference. After changing the zone certificate, provision the Intel AMT devices. Rediscover all the AMT devices. For more information on how to discover a device, see Device Discovery in the ZENworks Discovery, Deployment, and Retirement Reference. Provision the Intel AMT devices. For more information on how to provision an Intel AMT device, see Provisioning the AMT Devices.